Portuguese Man-of-War (called the Bluebottle in Australia) is a floating colony of animals that lives in warm seas. This poisonous animal is called the Man-of-War because it looks a bit like a Portuguese battleship with a sail. 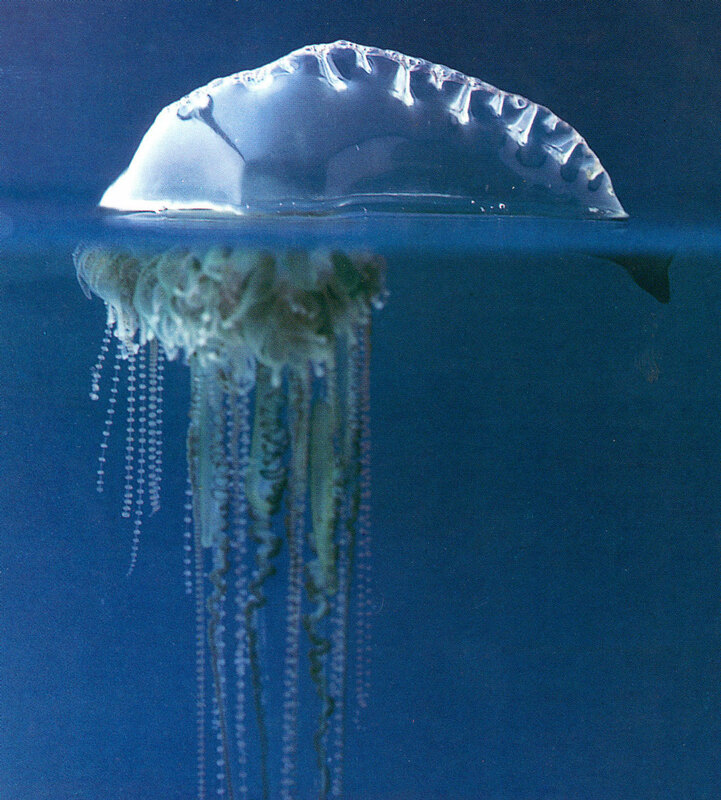 The Man-of-War is eaten by many animals, including sea turtles. A small fish (Nomeus gronovii, 8 cm long) is mostly immune to the Man-of-War’s poison and lives protected (from other predators) among the tentacles. This fish eats the tentacles (which are regenerated), but sometimes the fish is eaten by the Man-of-War. The Man-of-War floats on a gas-filled, blue to pink, translucent body called a pneumatophore (belonging to a single animal). The body is 3 to 12 inches (9-30 cm) long. The crest (only a few inches tall) above the float acts like a sail, moving the animal across the seas. Polyps support the tentacles and are located under the float; there are 3 types of polyps: dactylozooid (that find and catch prey with poisonous stingers called nematocysts), gonozooid (that reproduce), and gastrozooid (that digest the food, like a stomach). The coiled, stinging tentacles can be up to 165 feet (50 m) long.